When it comes to the two cosmic heroes Ronan and Star-Lord the two have not battled each other many times. The two work together in the stories Annihilation, Thanos Imperative and against the Phalanx. However, the two have a brief battle in Guardians of the Galaxy. Star-Lord visits Hala the Kree homeworld and is angered when he sees the Kree are rebuilding the Phalanx as a defense mechanism. He then confronts Ronan. Star-Lord manages to land a few blows on Ronan but cant do much damage. Ronan then knocks him down and tosses him (Without much issue) into another dimension. Generally speaking Ronan is far more powerful than Star-Lord. He is faster, more durable, more trained, and far more strong. His Universal Weapon also gives Ronan access to all kinds of powers. Star-Lord could try pecking away at Ronan from a distance with his element gun or Kree machines guns but eventually Ronan would get hold of him and that would be that. The Universal Weapon also can fire power blasts meaning that even at a distance Star-Lord would be at a disadvantage. In the MCU the same power disparity between the two exists. 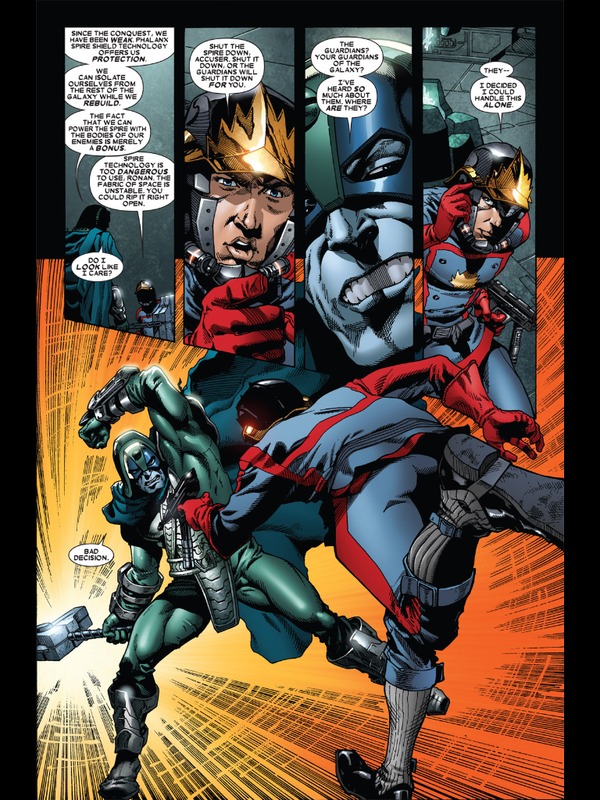 Despite the power difference Star-Lord through use of trickery and teamwork fared better than his comic counterpart. Star-Lord went up against Ronan on the planet of Xandar. Ronan was holding the power Infinity Stone and thus extremely powerful. Instead, of facing him in combat Star-Lord distracts Ronan by challenging him to a dance off.